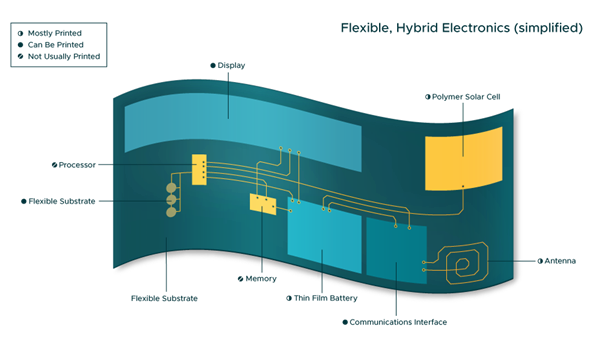 Flexible electronics, a technology for assembling circuits by mounting devices on plastic substrates that can bend, stretch and twist un-tethered by wires, offers important advantages over conventional electronics built on rigid substrates. Among the products that this technology is rapidly making possible are folding smartphones with wraparound displays that can fit into a pocket but unfold into a full-sized tablet, photovoltaic sheets and wearable or implantable devices that are better able to interact with the human body; conventional rigid electronics cannot be worn comfortably and do not do well when a body moves or when a sensor is placed on the soft tissue of an internal organ. 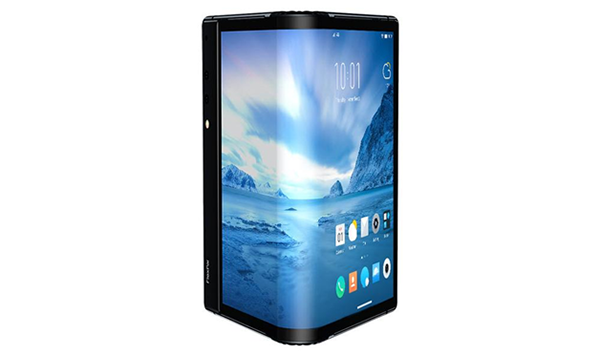 At the Consumer Electronics show earlier this year Chinese startup Royole showed off the world’s first commercial smartphone with a flexible display. Called FlexPai it is a combination of mobile phone and tablet (it has the portability of a smartphone plus the screen size of a tablet). Unfolded, FlexPai provides a 7.8” color display screen with 4:3 aspect ratio and a 1920 x 1440 resolution. FlexPai can be folded from 0 to 180 degrees to easily fit into a pocket. It Includes two cameras with 20 and 16 megapixels that can be bent to capture objects at unique angles. Royole’s flexible displays are produced at the company’s mass production campus in Shenzhen, China, a 100% self-designed, R&D and manufacturing facility with a total investment of around $1.7billion. Royole further showed how the same flexible displays could be used for automotive dashboards, wearables and for various other commercial and industrial uses. Also at CES LG unveiled a 65-inch OLED television that that rolls into and out of a base stand. It can be furled and unfurled on demand, extend part way to display photos or act as a control screen for smart devices, or unfold completely for full viewing. The company also showcased an “LG waterfall” formed from dozens of curved displays at the entrance to its CES booth. The Korean company announced that its scrolling screen will be available for purchase during the second half of 2019. The academic community is engaged in a broad range of research topics directly relevant to flexible electronics and associated production. In a paper published Feb. 1 in Science Advances, researchers from the University of Houston reported significant advances in stretchable, rubbery semiconductors, including integrated electronics, logic circuits and arrayed sensory skins, moving these applications closer to commercialization. Carrier mobility, or the speed at which electrons can move through a material, is critical for an electronic device to work successfully because it governs the ability of the semiconductor transistors to amplify the current. The University of Houston researchers discovered that adding minute amounts of metallic carbon nanotubes to the rubbery semiconductor P3HT (polydimethylsiloxane composite) leads to improved carrier mobility by providing what they described as “a highway” to speed up the carrier transport across the semiconductor. At the University of Southampton researchers are collaborating with industrial partner PragmatIC on a Process Design Kit (PDK) that will expand the potential for the mass market uses of flexible electronics. PragmatIC creates flexible integrated circuits (FlexICs) that can be embedded into packaging to personalize product information and present promotional offers. The prototype PDK developed through the project applies the school’s design flow expertise to PragmatIC’s flexible transistor technology. Integrating silicon components, printing with conductive inks and pasting on stretchable substrates yields so-called flexible hybrid electronics (FHE). The term refers to curved and variable form factor integrated devices with both printed components and conventional (although slimmed down) CMOS-based devices. FHE’s advantage is that it preserves the full operation of traditional electronic circuits but in conformable architectures. Over the past few years and in recognition that it is important to share information as well as collaborate with multiple entities on FHE projects, major U.S. and international companies have formed public/private consortiums to launch targeted, large-scale programs with significant government funding to develop these new technologies. For example, to advance the growth of the FHE ecosystem, the public/private partnership SEMI-FlexTech recently issued a Request for Proposal (RFP) for a demonstrable, modular multi-disciplinary FHE sensing system applicable to flexible, lightweight mobile and/or curved constructions. Another RFP asks for renewable, sustainable power systems employing flexible hybrid electronic components. The SEMI-Flextech proposal process consists of two stages starting with a white paper review. White papers will be accepted until March 1, 2019, at 5:00 p.m. PST. Full proposals will be due by April 15, 2019, and award notifications will be issued on or about June 1, 2019. Approximately $5 million is allocated for these projects. Primary funding will be provided by the U.S. Army Research Laboratory (ARL) through SEMI-FlexTech. NextFlex is another consortium of companies, academic institutions, non-profits and state, local and federal governments with a shared goal of advancing U.S. manufacturing of FHE. Formed in 2015 through a cooperative agreement between the US Department of Defense (DoD) and the FlexTech Alliance, the consortium is currently developing an FHE PDK and a Modeling and Design Roadmap.